Radon (222 Rn) is a naturally occurring radioactive isotope of 238 U series, which is a colorless and odorless gas with a half-life of 3.82 days. Among many natural radiation sources, radon is one of the significant sources because of its potential exposure to the human beings. Radon gas and its daughter products can easily enter the human lungs through inhalation. The daughter products of the radon (218 Po,214 Pb,214 Bi, and 214 Po) which get deposited in the lungs can result in biological damage to the lungs through the emission of alpha and beta particles, with carcinogenic potential. The main source of environmental radon is primordial radionuclides present in building materials, soils, and rocks. The radon exhalation rate, hence, mainly depends on the presence of radium content in the material. “Can technique”, for the measurement of radon exhalation rate in soil has been used in many studies. Recently, Tabar et al. reported radon exhalation rate and effective radium concentration in soil samples from southern region of Sakarya, Turkey. Ranjan et al. reported radon exhalation rate in soil samples from Karbi Anglong district of Assam, India, using can technique. Abd-Elmoniem reported radon exhalation rate in soils using can technique in Sudan. In the present study, radon exhalation rate in the soil samples of Cauvery river basin was measured, and values over different seasons were compared. The Cauvery river is one of the major rivers in South Karnataka, India, which originates in the Brahmagiri hills in the Western Ghats and flows in an eastwardly direction passing through the states of Karnataka, Tamil Nadu, Kerala, and the union territory of Puducherry., The river basin lies between latitudes 10° 05' N and 13° 30' N and longitudes 75° 30' E and 79° 45' E. The length of the river flowing in Karnataka is 320 km. The river basin covers 2.47% (81,155 km 2) of the total geographical area of India. The drainage basins of the Cauvery and their tributaries experience tropical monsoon climate with bimodal rainfall pattern. As these basins cover a large area of peninsular India, variability in climate is introduced by altitude, mountain barriers, air mass movement, and distance from the coast. 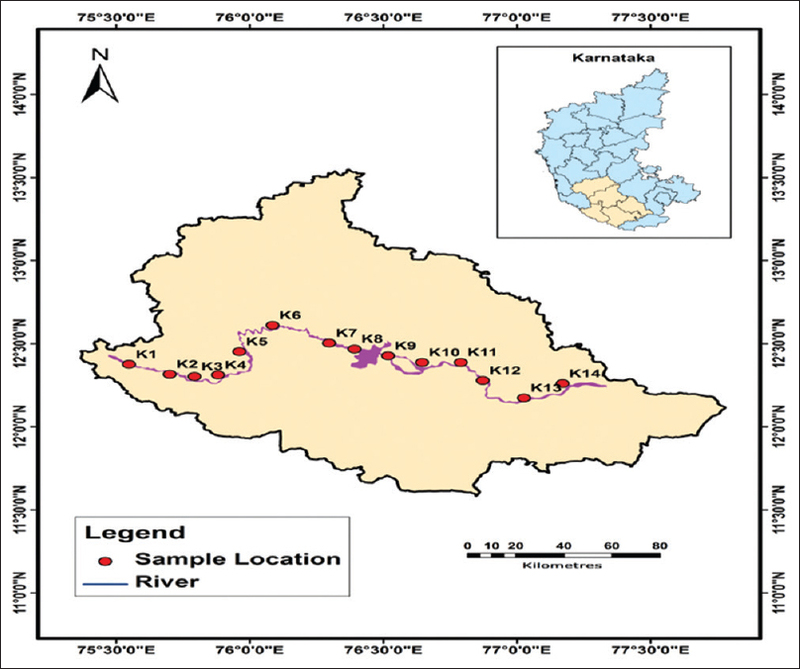 The sampling stations along the Cauvery river were identified based on geological studies, and samples were collected from the upper reaches (K1) to the lower reaches of the river (K14) as depicted in [Figure 1]. The soil samples from the river basin were collected following the EML standard procedures. The samples were collected during January 2014 (premonsoon). The samples were brought to the laboratory for further processing and were processed using standard procedures. The samples were kept in air-circulated hot air oven to remove the moisture content in the samples. In the present investigation, sealed “can technique” with LR-115 solid-state nuclear track detector (SSNTD) was used to measure the radon exhalation and effective radium concentration in the soil samples of the Cauvery river. The processed samples were sieved through a 250-μ mesh, and a known amount of soil sample was taken in a “can” (diameter of 7.0 cm and height of 10.5 cm). LR-115 Type II SSNTD (3 cm × 3 cm) was fixed on the top inside of each “can.” The LR-115 film inside the can was exposed to radon for 90 days. The films (detectors) were removed and then etched in 2.5 N NaOH at 60°C ± 1°C for 60 min in an etching bath at constant temperature to enlarge the tracks produced from the alpha particles emitted from the decay of radon. The produced tracks were counted using a spark counter. Where ρ is the track density in cm −2, K is the sensitivity factor (k = 0.0312 tracks m −2 d −1 Bq −1 m −3), and T is the exposure time (h). Where EA is measured in Bq m −2 h −1 and EM in Bq kg −1 h −1, V is the effective volume of can (m 3), C is the integrated radon exposure as measured by LR-115 SSNTDs (Bq m −3 h), T is the exposure time (h), l is the decay constant for radon (h −1), A is the area of the can (m 2), and M is mass of the sample. The radium concentration and radon exhalation rate in the soil samples of Cauvery river were measured using “can technique” and the results are summarized in [Table 1]. The activity concentration of radon ranged from 26.39 to 403 Bq m −3, with a mean value of 216.15 Bq m −3. The radon surface exhalation (ES) ranged from 80.92 to 1890.39 mBq m −1 h −1, with a mean value of 521.08 Bq m -1 h -1, and the radon mass exhalation (EM) ranged from 29.99 to 1052 mBq kg −1 h −1, with a mean value of 247.21 mBq kg −1 h −1. It can be observed from the results that the radon exhalation rate varied appreciably from one sample to another. The high radium concentration in soil was found at location K12. The mass exhalation rate and surface exhalation rate in soil samples were found to be high at K12. The variation may be due to the geological condition of location, geochemical process in soils, and rain effect in the sampling locations. The river basin contains Archean granitoid gneisses (amphibolite facies) and intrusive, Closepet granite, Precambrian granulite, supracrustal belts of rocks, volcanic rocks, felsic volcanic rocks, and caustic and chemical sedimentary rocks. The radionuclides may move to the soil phase from rock phase due to chemical weathering and due to heavy rain, the soil leaches out to sediment phase. The Cauvery river basin has the highest soil erosion (more than 400 ton ha −1 y −1), as reported by Brema and Hauzinger. 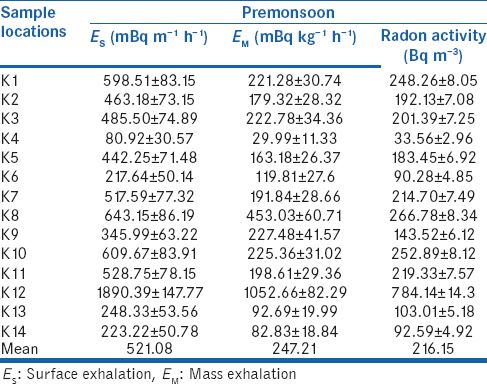 The radon exhalation rate and radon activity in monsoon were reported by Kaliprasad et al. and compared with that of the present investigation, which is presented in [Table 2]. Pre monsoon, the activity concentration of radon ranged from 33.6 to 784 Bq m −3. The variation in radon activity depends on the type of soil and seasons. The mean radon activity pre monsoon was significantly higher than the activity in monsoon. The variation may be due to the parent radionuclide 226 Ra which is more readily leached from soil during the rainy season. The radon activity and radium concentration were measured using the “can technique.” The measured radium concentration and radon activity in soil varied from location to location. This may be due to the geological changes in the locations. The high exhalation rate in few locations may be due to the presence of parent materials and soil type in that area. Kaliprasad CS, Vinutha PR, Narayana Y. Natural radionuclides and radon exhalation rate in the soils of Cauvery River basin. Air Soil Water Res 2017;10:1-7. Tufai M, Mirza SM, Mahmood A, Qureshi AA, Arfat Y, Khan HA. Application of a closed-can technique for measuring radon exhalation from mine samples of Punjab, Pakistan. J Environ Radioact 2000;50:267-75. Fazal-ur-Rehman, Al-Jarallah MI, Musazay MS, Abu-Jarad F. Application of the can technique and radon gas analyzer for radon exhalation measurements. Appl Radiat Isot 2003;59:353-8. Yadav M, Prasad M, Joshi V, Gusain GS, Ramola RC. A comparative study of radium content and radon exhalation rate from soil samples using active and passive techniques. Radiat Prot Dosimetry 2016;171:254-6. Tabar E, Yakut H, Kuş A. Measurement of the radon exhalation rate and effective radium concentration in soil samples of Southern Sakarya, Turkey. Indoor and Built Environment 2003;27:278-88. Kakati RK, Kakati L, Ramachandran TV. Measurement of uranium, radium and radon exhalation rate of soil samples from Karbi Anglong district of Assam, India using EDXRF and can technique method. APCBEE Proc 2013;5:186-91. Elzain AE. Determination of radium concentration and radon exhalation rate in soil samples using CR-39. Adv Appl Sci Res 2015;6:96-102. Kaliprasad CS, Narayana Y. Speciation and behaviour of 210Po and 210Pb in the riverine ecosystem of Cauvery, a major river of South India. Radiochemistry 2016;58:431-7. Narayana Y, Kaliprasad CS, Sanjeev G. Natural radionuclide levels in sediments of Cauvery riverine environment. Radiat Prot Dosimetry 2016;171:229-33. Kaliprasad CS, Narayana Y. Distribution of natural radionuclides and radon concentration in the riverine environs of Cauvery, South India. J Water Health 2018;16:476-86. Kaliprasad CS, Vinutha PR, Narayana Y. Natural radionuclides and radon exhalation rate in the soils of Cauvery River basin. Air Soil Water Res 2017;10:1-7. [doi: 10.1177/117862211774694]. Abujarad F, Fremlin JH, Bull R. A study of radon emitted from building materials using plastic track detectors. Med Biol 1980;25:683-94. Qureshi AA, Kakar DM, Akram M, Khattak NU, Tufail M, Mehmood K, et al. Radon concentrations in coal mines of Baluchistan, Pakistan. J Environ Radioact 2000;48:203-9. Singh AK, Jojo PJ, Khan AJ, Prasad R, Ramchandran TV. Calibration of track detectors and measurement of radon exhalation rate from solid samples. Radiat Prot Environ 1997;3:129-33. Brema J, Hauzinger J. Estimation of the soil erosion in Cauvery watershed (Tamil Nadu and Karnataka) using USLE, OSR. J Environ Sci Toxicol Food Technol 2016;10:1-11.